James Rod works with disco don Rayko a lot, often appearing on his Rare Wiri label. Now the favour is returned as Rayko brings the disco heat to Rod's Golden Soul imprint. 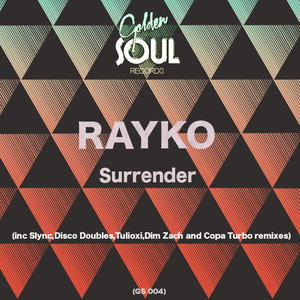 On "Surrender" Rayko is found in full 80s mode, re-editing some prime FM-friendly synth-soul with added AOR guitar licks. Like stretching the instrumental break from a Lionel Richie b-side and turning into a cool Daft Punk jam. There are plenty of cool remixes too, highlights of which include Dim Zack's sleek Paradise Garage-style rework and Tulioxi's deep space disco version.